To succeed in the U.S. academic system, you will need to learn how it is organized and how it works, or, as we sometimes say, "how to play the game." Listed below are some suggestions that you should keep in mind as you begin your studies. You will learn more of the formal rules of academic success as you undertake courses and have the opportunity to talk with fellow classmates or peer advisors. The more you discuss these topics, the sooner you will be able to develop a understanding of the way your academic department functions. Keep in mind that a period of adjustment to a new educational system is necessary before you will be able to perform to the best of your ability. Don't be discouraged if your grades during the first semester are not quite what you expected. It takes time to get accustomed to the language and the way course assignments are evaluated. Especially during your first semester, do not take more courses than are required. Balance your course schedule to provide you with sufficient time to study and also time to participate in campus activities. Work hard from the beginning. Don't fall behind on daily/ weekly course assignments! The U.S. system is based on continuous assessment, so make sure you keep up with your work during the semester. Professors in the U.S and especially at Puget Sound expect students to ask questions in class (or immediately following the class). They expect students to see them in their offices when the students are having problems. Any time you feel unsure of what is expected of you in a class, ask the professor and some of your fellow students about it. If you do not ask, it will be assumed that you understand the coursework. Consider the value of a different educational system. From your past experience, you may have developed certain assumptions about the purposes and methods of education, and about the way your field of interest should be studied. For example, you may assume that it is best to examine narrow aspects in great depth. At Puget Sound, by contrast, you may find that memorization of material is less important than synthesizing material from a variety of sources. It is important to realize that differences of this kind exist between the U.S. and other educational systems, and that one is not necessarily better than another. There are many different ways of learning. Be open-minded and adaptable and you will have a richly rewarding academic experience at the university. Remember, we are all here to help you succeed. The U.S. academic system, as a whole, is intended to provide a broad education for as many people as possible. There is no screening examination which directs a student at an early age into an academic or non-academic area. A high proportion of the population completes secondary school - and secondary school is not as challenging as it is in countries where access to education is more limited. A high proportion of the population attempts some type of post-secondary education. The U.S. educational system also produces specialists, people who have studied a limited range of topics in depth. However, specialization comes later in the U.S. system than it does in most others. It is not until the third (junior) year of undergraduate work that a student concentrates on the study of his major field. As in any educational system, it is considered important to evaluate students' work. At Puget Sound a letter grading system is used to rank and compare students' academic work. Grades receive considerable attention in competition for scholarships and fellowships, for admission to universities and for jobs. This discussion is limited to higher (post-secondary) education. The Puget Sound academic year is two semesters of approximately fifteen weeks length. In addition, there are two summer sessions. The quantity of academic work a student does at the university is measured in units. Most courses at Puget Sound are worth one (1.00) unit. Exceptions include most activity classes which are worth .25 unit, and a few .5 unit academic courses. A unit is equivalent to 4 semester credits. The quality of a student's academic work is measured by means of grades and made part of the student's record through his or her Grade Point Average (GPA). Please read the Academic Handbook for a complete discussion of grades. The most common method of instruction is the classroom lecture. The lectures are supplemented by discussion (especially when classes are small), by reading assignments in textbooks or library books, and by periodic written assignments. It is important for the student to contribute to discussions in the classroom. In some countries it is "disrespectful" for the student to question or challenge the professor. In this country, by contrast, questioning or challenging the professor is viewed as a healthy sign of interest, attention, and independent thinking. In many classes, your grade will be determined in part by your contributions to class discussion. When the class is too large to permit questions and discussion, or if for some reason you do not have the opportunity to raise questions in class, you can visit privately with the professor during his or her office hours or make an appointment to see the professor. Professors usually announce their office hours at the first meeting of the class. If your lecture class is very large, the professor may structure one or two discussion sections per week. Attendance is required for these sections. Grades are usually based on class participation. The seminar is a small class at the advanced undergraduate or graduate level. It is likely to be devoted entirely to discussion. Students are often required to prepare presentations for the seminar, based on their independent reading or research. Many science courses require work in a laboratory where the theory learned in the classroom is applied to practical problems. In many courses you will be required to write a term paper (often called simply a paper). A term paper is based on study or research you have done in the library or laboratory. Your professor will usually assign a term paper in the early part of the course. You are expected to work on it during the semester, and submit it near the end. The grade you receive on the term paper may constitute a significant portion of your grade for the course. While there are helpful booklets available in bookstores and the libraries which explain the format of a term paper, including the use of footnotes and bibliographies, you should first check with the Center of Writing and Learning and Teaching, located on the first floor of Howarth Hall. There are many resources at the Center to help you with papers and homework. Make sure you go early in the semester, as the Center gets busier during midterms and finals. If you have questions about a particular term paper assignment, you should discuss them with the professor. 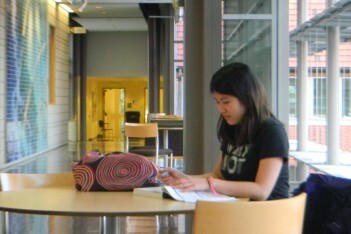 All Puget Sound students have access to computer labs located at several campus locations. Keep in mind that access may be limited during times of high usage (during mid-terms and finals). In both the preparation of term papers and in doing assignments for your classes, you are likely to use the library more than you have in the past. It is important, therefore, to learn how the library is organized. Our librarians are happy to answer your questions about the library's organization, the location of specific materials, bibliographies, etc. The U.S. education system is, in general, a system of continuous assessment. This means that you will have many examinations, quizzes, and tests. Nearly every class has a final examination at the end of the semester. Most have a mid-term examination near the middle of the semester. There may be additional tests or quizzes given with greater frequency, perhaps even weekly. All these examinations are designed to assure that students are doing the work that is assigned to them, and to measure how much they are learning. The student must choose from among a series of answers, selecting the one (or more) that is (or are) most appropriate. The student must match words, phrases, or statements from two columns. The student must fill in the blanks left in a phrase or statement in order to make it complete and correct. Sometimes called "essay questions", subjective examinations require the student to write an essay in response to a question or statement. This kind of examination tests a student's ability to organize and relate his/her knowledge of a particular subject. The professor will expect an in-depth account which will demonstrate the student's broad grasp of the topic. The length of the essay will depend on the complexity of the question asked and the expectations of the professor. Your professor will usually discuss his/her requirements at the beginning of the course or class period. If you are not sure of the instructions, ask the professor or other students. In general, citizens of the U.S. prize independence and individual effort. In the academic world, they value independent thought. The most serious offense in the academic world is that of representing another person's work as one's own. Copying another person's work without acknowledging that the other person is responsible for it is called "plagiarism." Plagiarizing the work of another scholar can result in expulsion from the university. If you are uncertain what constitutes plagiarism, visit the Center for Writing, Learning, and Teaching and speak with your professor. International students must remain enrolled full-time (3 units) during the entire length of the semester. You can only drop a class if you remain enrolled for 3 units. A student can withdraw without record on the permanent transcript of the student completes official withdrawal procedures within the first two weeks of the semester. Note: If you have difficulties, contact the International Student Advisor immediately. There are certain exceptions for a reduced courseload, so talk with the International Student Advisor before withdrawing from any classes. A 2.0 minimum cumulative grade average for undergraduates or graduates and a 3.0 minimum cumulative grade average for master's degree candidates is required to maintain "good academic standing". Student not meeting the minimum standards face several levels of academic penalty. A student whose cumulative grade average is below 2.00 for the first term is placed on academic probation and remains there if his/her cumulative grade average is below 2.00 in subsequent consecutive terms. A student whose cumulative grade average remains below 2.00 in the second consecutive term is dismissed from the university. A student may be dismissed and precluded from returning to the university ever again. Expulsion could occur, for example, in a severe case of academic dishonesty. If you are faced with any type of academic suspension or probation, you should meet with your faculty advisor and contact the International Student Advisor. For a list of others who can be of assistance to you, please consult Appendix IV. fails to return to Puget Sound for the next semester (except summer), without graduating or without completing transfer procedures.